In March, I happened to be in Adelaide for the 2013 Adelaide Festival, and while there, I took a chance to visit the collection rooms of the Art Gallery of South Australia. In the beginning I was little confused that the space seemed cluttered with art works. Such an attempt to show off nearly entire collection can be often observed in country art museums and would not necessarily be considered ‘tasteful’. The recent acquisition through the Gallery’s Contemporary Collector’s program – Berlinde De Bruyckere’s ‘We are all flesh’ – a dramatic sculptural object of hanging horse skin was placed in the middle of a rather small room whose walls were covered with framed classic paintings. The rules of the game became clear in the next gallery room that contained a glass box of the epic miniature world by British contemporary artists Jake and Dinos Chapman and a video work by Russian group AES+F. These works clearly formed relationships with a range of Old Master pieces ‘packed’ in the same space. I was not bored by an order of horizontally cantered works on the wall: the arrangement of paintings seemed random and featured ‘blocks’ of various art works. It occurred to me that this sort of presentation looked like a version of MONA’s kaleidoscopic mix of contemporary art works and antique objects. By now, everyone in Australia and, I assume, in the art world must have heard comments about the Museum of Old and New Art – the private museum of mega-collector David Walsh in Hobart, the beautiful Tasmania. 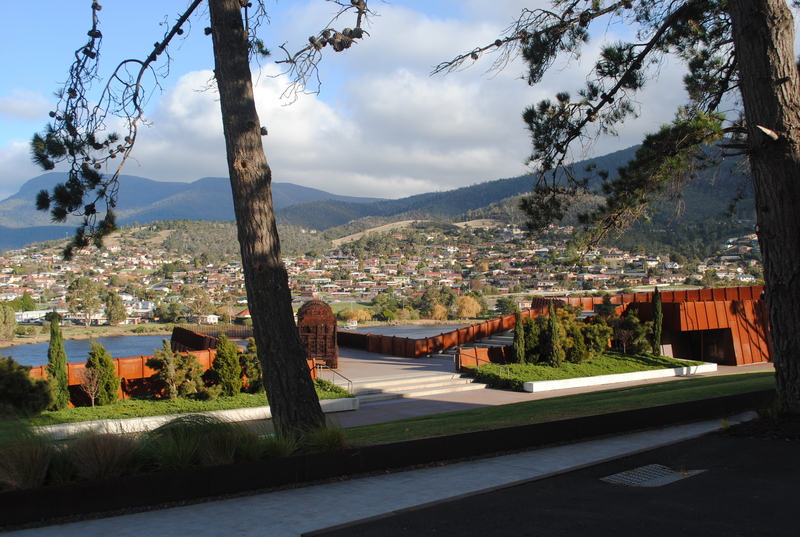 And since 2011, very many people from around Australia and the world have visited MONA. So far, I have travelled to see MONA twice. The way how the ancient and contemporary works were presented also led to a discovery of new meanings that emerged in the relationships among them. It was MONA’s next exhibition – ‘Theater of the World’ (23.6.2012 – 8.4.2013) curated by renowned French Curator Jean-Hubert Martin that further explored interpretation of classic works and antiquities through their integration in contemporary context. The presentation of objects and artworks manifested the intention of curator in creating meanings and even included combining different art objects together as one piece. The controversy of this exhibition has not been discussed enough. I would like to predict that what I observed at the Art Gallery of South Australia was a sign of MONA’s far-reaching influence in art museum and gallery sector, providing a shift in the curating practices and interpretation of collections in public museums. Such art museum objectives as ‘getting closer to the contemporary viewer’ and ‘being in the forefront of art development’ make no difference between public and private institutions. In this respect, the museums are even in competitive relationships with each other, especially with the increase in the number and scale of private museums in the world. Private ones can be more liberal in their approaches and, in this situation, the public museums need to keep up to sustain their leadership. On the economic other side of the things, the pressure to attract large audiences – and thus show evidence of economic benefits is too on the agenda of public art museums. Interestingly, that same Gallery of South Australia recently celebrated findings by Deloitte Access Economics that according to data from the 2010 – 2011 financial year ‘(..) for every dollar contributed by the South Australian Government, over three dollars were fed back into the economy’. MONA is a big player now in Australia and an important one in the art world. It is certainly my favourite museum – the place of experience for all senses. I will keep returning to it for new experiences, perspectives and discoveries.